So, you want impartial reviews of Lead Forensics. We are a competitor of Lead Forensics and a lot of our customers are ex-triallers or subscribers to Lead Forensics, who have become enlightened. That comment is not impartial – it’s there to show you that people come to us, having used Lead Forensics before. Others trial Lead Forensics and then look around for alternatives (which may be what brought you here). But the comment above is relevant because the reviews online (summarised on this page) often demonstrate that people didn’t really shop around before choosing Lead Forensics. Much of what follows is impartial, and even highlights why the Lead Forensics offering would be the best option for some businesses. What’s the difference between A1WebStats and Lead Forensics? You can gain a lot more business from your website visitors with A1WebStats at a vastly lower cost, than you can with Lead Forensics. Yes, we show you companies that visited your website, but we also provide functionality that allows you to gain more business from your website by utilising a more intelligent approach to website success. Lead Forensics would say that they have the biggest database of identifiable companies in the world (which they can’t and won’t prove), that they spend huge sums on their software, and overall, that their product is the magical answer to gain you more business from your website. Lead Forensics is undoubtedly a slick looking, attractive tool, with (based on reviews) good levels of support for their customers. Has higher budgets to spend on tracking companies that go to your website. Doesn’t have a problem with being locked into a 12 month contract (and having to actively cancel it or it’ll roll over automatically). Has dedicated sales people who will totally absorb the companies data that Lead Forensics supplies … and then act upon it to the point that you get return on the software cost, and the cost of the sales people. Has a website that is under-performing and you want to pick up on potentially lost opportunities (companies that visited but didn’t make contact). See more about this further down this page at The fundamental problem with Lead Forensics. Wants to see contact details of people within the business (and don’t mind paying extra to access that information). Note: these are probably not the people who visited your website – they are just details of people within that business. Lead Forensics often refer to how they are registered with the ICO and apparently play by the rules. You only have to look at the one star reviews via https://uk.trustpilot.com/review/www.leadforensics.com to see their reference to the ICO, but equally, you will also see there complaints from people who feel that Lead Forensics are breaking the rules. You can filter data and see partial details of contacts there. That may excite you. You have the option to buy details of those contacts. Pause for just a moment and ask yourself: where did the contacts information come from? You’re happy – you have the contact details of people in that business and you go off and reach out to them. And that’s when you potentially hit a problem. The person you contact is not happy that you have contacted them via their named contact details. They started talking about GDPR and the ICO. We have worked hard to ensure that for business to business communication we are following the right process under GDPR and PECR to gather and process public information so businesses can offer relevant goods and services to other businesses. Without this it will be difficult for sales teams to engage new prospects which is why B2B is different to B2C. 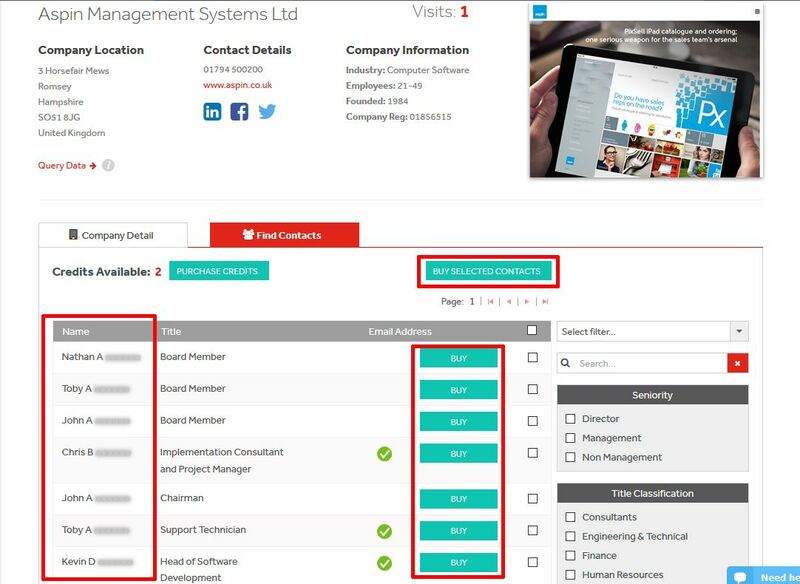 What gave Lead Forensics the right to put the contact details (including personal business email address) of people within their system, for you to buy? Those people may have provided that data to one or more systems, with the expectation that it was to be used on that system only. 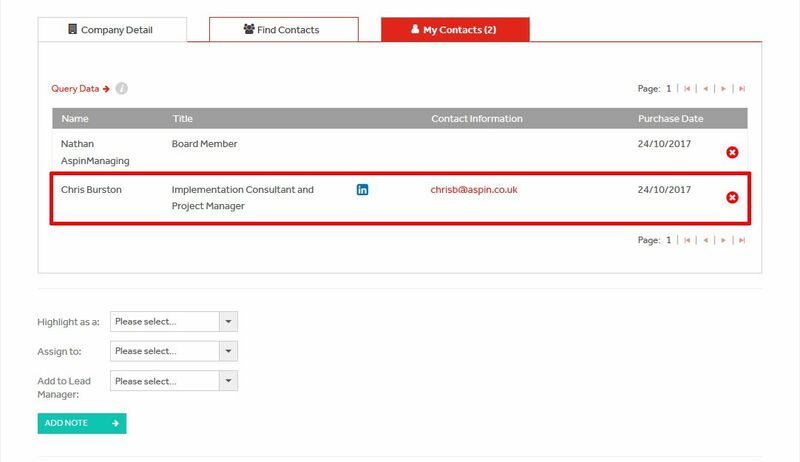 For example, someone may put their full contact details on LinkedIn, which means that if someone contacted them via that information, there would be no reason for complaint. But those people did not give Lead Forensics permission to harvest their data (from various sources) and present it within their own platform. So the question does have to be asked: is Lead Forensics totally GDPR compliant when they are taking people’s data from other sources and presenting it in their own system (which is then used by their customers to reach out to people)? And here’s another question: if you contact someone, having taken that information from Lead Forensics, and that person makes a complaint about you/your business to the ICO, who is to blame? If YOUR contact details were available to buy on the Lead Forensics database, would you by happy? Maybe it’d be worth you contacting them to ask if your details are on there and if they are, ask them to be removed if you didn’t give them permission to list them there? Otherwise you’re going to get hounded by other users of Lead Forensics when they see your company has been to their website. So what makes A1WebStats any different? We don’t attempt to supply contact details or go heavily into the company industry. Yes, we provide a button to click through to LinkedIn so that you can dig deeper, but we don’t assume that we know who visited the website, and we particularly don’t want to be in conflict with GDPR. We also are a lot cheaper than Lead Forensics and tend to cater for those customers who don’t need all those bells and whistles (and who also want to pay month to month and not be locked into a contract). This is the A1WebStats view of where Lead Forensics doesn’t work. It’s a view derived from thousands of conversations with businesses over the years. Most companies come to us because they’ve been cold contacted by Lead Forensics. They sign up for their Lead Forensics trial and then they look around for alternatives, which brings them to us. Those companies feel that there is a lot of value in tracking companies, because it is new to them. They are mostly unaware that there is a better solution to gaining more business, than simply chasing companies (as detailed within The fundamental problem with Lead Forensics). They don’t get past the trial stage – the lack of full access to their Lead Forensics account during the trial creates distrust, and the constant sales pitching trying to get them to buy is annoying. They realise that, even armed with data about companies that visited their website, they aren’t fully equipped with the resources or culture to best capitalise on that information. When they finally get a price (upwards of £150 per month and a 12 month contract), they can’t see how they could guarantee return on investment (which is often what leads them to search for alternatives, come to A1WebStats, where the arrangement is cheaper and month to month with no contract after the 30 day free trial). They don’t have strong enough traffic to their website to justify buying the product … or any product. That last point is important – at A1WebStats, we have a policy that if we see a business has 300 or less visitors to their website in a month, we will encourage them not to buy our product after the trial IF they are using it purely to identify companies. This is simply because, if identifying only 10-20% (typically) of their website visitors as companies, the numbers just aren’t enough to benefit from. Unfortunately, and it’s really sad when we hear this, we have heard many stories of businesses with low traffic levels ending up locked into a Lead Forensics contract, purely because they didn’t research the alternatives (such as searching Google for lead forensics reviews for example). This is high risk for Lead Forensics, as they have little control over the outcome. It’s quite surprising that they have gone down the Trustpilot reviews path, given that it can so easily bite them. What’s interesting about that is the initial impression is that they have 4 stars (Great). However, the data on the right shows that only 61% said Excellent, 15% said Great (which amounts to 76%). So that must be what makes it ‘Great’. Whether that’s enough to make it four stars is debatable especially when you see that 24% rated them Bad. As always with reviews, it’s worth spending time looking at the 1 or 2 stars reviews, of which you can see there are many. You can see the ratings numbers for yourself and it’s worth looking at both the 1 star reviews and the 4 and 5 star reviews. What’s good about the G2 Crowd reviews of Lead Forensics is that the reviewer is guided in what questions they have to answer and there are some great comments on there that are worth you looking through (both in favour of, and against Lead Forensics). As with Trustpilot and G2 Crowd, there’s a continuing pattern. Although there were (at the time of writing) only 16 reviews on https://www.trustradius.com/products/lead-forensics/reviews, there were some positive ones and some the other end of the scale. As already noted, it’s worth looking through the individual comments (positive and negative) those people have made. Although there were only 5 reviews at the time of writing, the reviews at https://www.capterra.com/p/156889/Lead-Forensics/ are mostly positive. Like some of the other reviews sites, people are encouraged to focus on the negatives as well as the positives, to bring some balance to the reviews, which is a nice touch. There is a long-running thread (since March 2012) at https://www.ukbusinessforums.co.uk/threads/anyone-use-lead-forensics.247390/, which has several posts from people (73 currently). The comments are more free-form (being a forum) and show quite a mix of viewpoints. The page https://fitsmallbusiness.com/lead-forensics-reviews-pricing/#comments attempts to compile a summary of various reviews online but it’s a bit too generic in it’s focus. The site feels like it’s curated snippets of information from other sources and then has 5 reviews on their own website (which are a mixture of positive and negative aspects of Lead Forensics). The page https://www.reviews.co.uk/company-reviews/store/leadforensics only has 3 reviews of Lead Forensics but each one is 1 star. We do have to say here that, even though it’s negative about Lead Forensics, you can’t consider that small number of reviews as being statistically relevant. 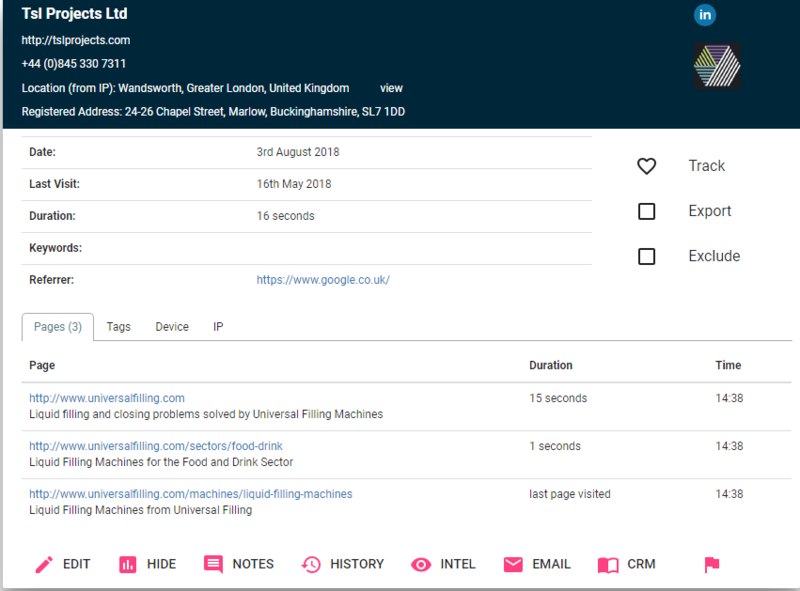 When you dig deeper you realise that this is not a website where anyone can post up a review – it’s very much a closed shop where people (Lead Forensics in this case) can add their company and appear to have control over what appears in the reviews. It’s not just Lead Forensics though – if you look at other companies within Featured Customers, they’re all the same – positive testimonials that those companies are happy to have showing. It’s probably a good thing this website isn’t (currently) on page 1 of Google because it only allows a one-sided view of reviews. Chasing companies that visited your website (but didn’t make contact with you) is one of the worst uses of your time. Take a view of the number of visitors to your website within a given time period: we’ll use 100 as a round number to work with. Identify how many of those went to your website pages of importance (which implies that they have a level of interest in what you offer). Say that number was 60. So 60 visitors got to your pages of importance (e.g. product or service pages) out of the 100. What about the other 40? Some of them may have been junk traffic. Many of them could have been potential customers who didn’t like your website enough to persevere with it. Lead Forensics (and others, including us) will allow you to see a segment of your website visitors and identify some of those as companies, including what they looked at page by page. The percentage identified will vary depending on industry and marketing activity, but 10-20% would be normal, with some businesses getting higher levels. So if you had 100 visitors to your website, you’d likely be able to see 10-20 (sometimes higher) of them as being identifiable companies. Amongst those identifiable companies there will be some that interest you, but who haven’t made contact with you. It may seem attractive to try and reach out to those companies but what you’re effectively doing is applying a sticking plaster to a large wound. That large wound is: failures within your website. If your website was strong enough, many of those companies would choose to contact you. The very fact that they didn’t contact you probably means that something didn’t resonate with them. Out of the sample 100 visitors to your website, you identify that 30 got to page X (which may be a product or service page). Of those 30, a percentage may be identifiable as companies. Let’s be optimistic and say 20%. That’s 6 companies that are identifiable and you could feasibly contact those that aren’t competitors, suppliers, or others you’re not interested in. 30 minus 6 = 24 other visitors who got to your page X. Lead Forensics only show you those who were identifiable as companies. They don’t want you to think deeper about the bigger problem. Company people using a mobile device not connected to the company network. For example, they’re looking for your types of products/services while travelling or at home. Company people who are working from a different location (e.g. at home, or from a hotel). Company people who are accessing your website from their company location but there’s no way of identifying them by their IP address (this is common in smaller businesses and also companies that actively hide their visibility. There are also many businesses that work from serviced offices and won’t have their own unique identifiable IP address). So there you are, focusing on the 20% who you can potentially contact, oblivious to the 80% that you won’t see within the Lead Forensics system (or many other similar ‘companies chasing’ systems). But you CAN see them within our product, A1WebStats. You have competitors who are Company B, Company C, and Company D.
You (Company A) and Companies B & C are tracking companies who go to your websites. Company D are tracking companies but they are immensely more focused on what matters. Read on to see what matters and why Company D will beat you and your competitors into the ground (over time) and take business away from you. Company A (you), Company B, and Company C, all see identifiable companies going to your websites. In fact, many of those visitors have probably worked their way down the Google search results, trying to find a supplier that they want to interact with. So off you go – Companies A, B, and C chasing after those identifiable website visitors. Company D, who may not be as prominent as Companies A, B, and C in the search results, has used website analytics in an intelligent way. They’ve used A1WebStats (one of very few systems that allow you to do this) to focus on products and services they offer, closely analysing all visitors (whether identifiable as companies or not) to those parts of their website, and they have continuously made improvements to make their website a better experience for visitors. Company D have shown intelligence. Company D, over time, have built an online presence that makes Companies A, B, and C look weak in comparison. The potential buyer of products or services may have looked at the websites of Companies A (you), B, & C, but when they get to Company D, they find everything they wanted. Company D don’t have to chase that potential buyer. The potential buyer goes to Company D.
Any business that does not grasp this fundamentally basic concept is a business that is going to get trampled on by competitors. Having read this, if you STILL think that chasing companies is some sort of silver bullet, then we would welcome you to go off to any of our competitors instead of trialling A1WebStats – your mindset will not be a match for our passion (for companies to win through their websites instead of purely chasing companies who should have made contact in the first place). Yes, we’ll still show you companies that visit your website and what they looked at page by page, but we will also actively encourage you to make better use of the power within the A1WebStats system (that you can use totally for free within a 30 day trial). So what’s going to work for you? Our view is the same as it’s always been. 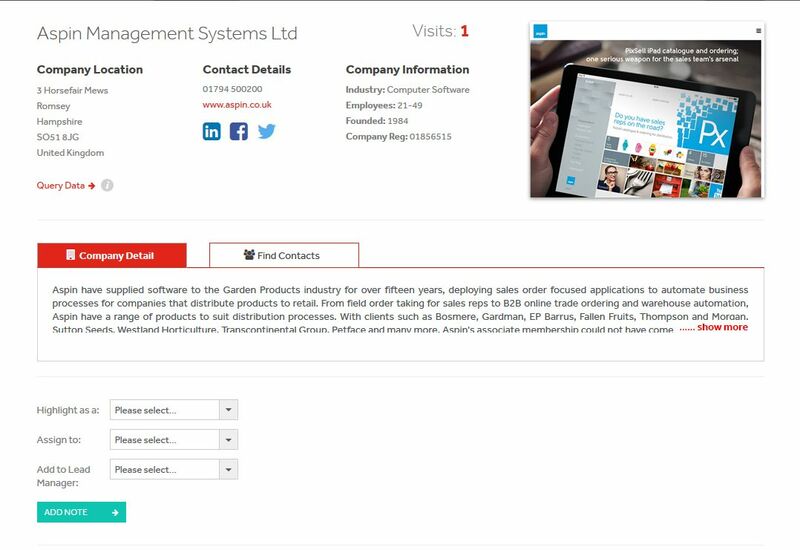 There are many suppliers of software that show you which (where identifiable) companies have been to your website. Limited resources/culture to chase companies that have visited their website. Don’t want to be locked into a 12 month contract (that has to be actively cancelled or it will roll over to the next year). Budget doesn’t reach to the minimum £150/month needed. Dislike not having the chance to experiment with the full product before having to buy/don’t like the very limited trial time period (typically a week). … but goes so much deeper into identifying ways that your business can gain a lot more from your website visitors – not just those that can be identified as companies. All you have to do is click on this link to sign up for your free trial and discover a better alternative to Lead Forensics. We’re here to help – all you have to do is reach out to us via any of the options on our contact page.